Tollhouse is a mountain thermal site. Be cautious of mid-day, summer conditions. HG pilots have been flying at Tollhouse since 1970. They usually meet mid-afternoon in the LZ to organize rides to launch. Typically, thermals suitable for PG flying start forming in the late morning. The wind usually picks up in the mid afternoon and then it backs off again in the late afternoon. Evening glass-offs occur on hot summer days. The wind direction traditionally swings around as the day progresses from SE, S, SW, W, NW, N.
There is often good lift over the valley, towards and around the LZ. Do not stay and scratch on the ridge if you don't get lift. If you start to sink out, you have a very good chance of catching a good thermal on the way to the LZ. Please be careful landing in the LZ on hot summer days as it can be quite turbulent, and arrive with plenty of altitude because you may encounter stronger winds upon approach. Tollhouse is an H3 and a P3 site. You must be an USHPA member to launch and land here. This is a sensitive flying site that has recently been re-opened so please play by the rules. Smoking is not permissible on launch or in the LZ. The LZ is located off of Tollhouse Road, across from the Tollhouse Cemetery. You may park in the cemetery parking lot and walk across the street to the LZ. Look both ways, before crossing the road and then follow the signs along the trail to the landing area. Please avoid landing or walking near the landowners home, adjacent to the LZ. 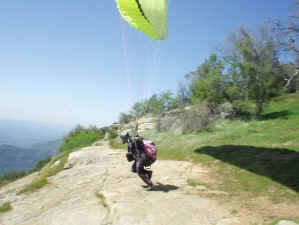 You must be a member of the Central California Hang Gliding & Paragliding Club to fly at Tollhouse. Instructions for joining the club, signing the waiver, and paying your dues can be found here. Ron Jones is the local host. He is happy to give site intros and other advice. Call ahead (559.313.0162) to let Ron know you are coming and to get the gate code. Good relations with the locals, and our ability to continue flying at Tollhouse, depend upon our complying with their request that we not land out in Tollhouse Valley. The turnaround from the LZ to launch is about 7 miles (approximately a thirty-five minute drive). The dirt road is steep and rutted (worse than Potato Hill, but not as bad as Elk Mountain). A 4WD truck or SUV, with good clearance, is preferable. A 4WD sedan, lightly loaded, might make it if you drive slowly. The dirt road to launch not accessible during the winter (usually from late September/October to late February/March, depending on the temperatures and the rainfall). Even if it is passable, driving on the dirt road this time of the year can cause damage to the road and is therefore discouraged. There is a gas station, a post office and a little convenience store in the town of Tollhouse, about 1/4 mile from the LZ. (Actually, that is the town of Tollhouse!) The store has ice, drinks and a few other essentials. There is a larger grocery store, a Longs Drug store, a really nice bakery/cafe, a Subway sandwich shop, a pizza parlor, a few assorted shops and a Mexican restaurant in Prather, about 10 miles from the LZ. If you didn't bring food, and you want to order a pizza, you can call the Pizza Factory in Prather (559.855.2800 - 29424 Auberry Road). If conditions are not flyable, check out Shaver Lake (~5,000' MSL). Keep on the paved road to launch, follow the signs, and you will be there in about half an hour. Rock climbing and mountain biking opportunities are plentiful, as well. For the sake of your wallet, try to avoid filling your gas tank here. There is camping at Dinkey Creek Campground, near Shaver Lake. The launch is in the Sierra National Forest. Tollhouse is a SW facing site. The altitude at launch is ~4,000' MSL. There is plenty of room for parking and pre-flighting gliders. The launch has a large, grassy slope that abruptly ends at an unforgiving 45-degree granite cliff. PGs must be flying before reaching the end of the launch. The penalty for blowing your launch could be severe. In light conditions, lay out your paraglider as far back as possible. Top landings by experienced PGs are possible, but not recommended. If you do choose to land on top, please do so only in light conditions and be aware of traffic in the air along the ridge while setting up your approach. The glide from launch (2,100' AGL) to the LZ is 4:1 or better (1.2 miles), but conditions can change fast. You must either get high enough to make it out of the valley or leave yourself enough altitude to make it to the designated LZ. Take 580 East, towards Tracy, to 5. Go South on 5, past Santa Nella, to 152. Go East on 152, through Los Banos, to 99. Go South on 99, ~10 miles, to Madera. Take the Millerton Lake/Yosemite exit. Turn Left at the first light and and cross over the freeway. You will cross over the railroad tracks, make an immediate Right and then an immediate Left onto Cleveland Avenue. Go 1.5 miles to 145 East. Turn Left and continue 17.8 miles to Road 206. Turn Right onto 206 and go 2.2 miles. Turn Left onto Millerton Road (just after crossing over the canal and a bridge). Go 5.7 miles to the T-intersection at Auberry Road and turn Left. Go 9 miles to Prather and turn Left onto 168. Go 2.5 miles to the stop sign and continue to go straight to Tollhouse. 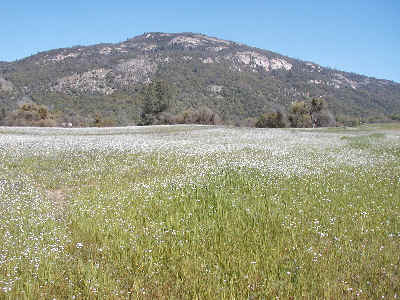 Continue 4.9 miles and, as soon as you see Sierra Elementary School on your right, turn Left onto Old Tollhouse Road. Go .8 miles and, at the Tollhouse Post Office, turn Right onto Tollhouse Road. Go 4.5 miles, to the summit of Tollhouse Road, and turn Right onto the dirt road across from a pile of rocks. (The intersection of Tollhouse Road and the road to launch is at N37 02.235 W119 23.200). At the first fork, take the Center road. At the second fork, take the Left road. Continue driving past the summit of the ridge. 2.0 miles from the paved road, bear right and continue to the launch area.